Property Size 2,840 sq. ft.
Orion's Heart is a little slice of heaven, tucked away in the Aska Adventure Area. While you feel like you are miles away from everything, you are actually only 7 miles from Blue Ridge, Georgia. Inside Orion's Heart, you will find luxury and comfort unmatched. 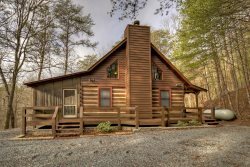 Outside, as you relax by the outdoor fireplace you can hear the rushing of the Toccoa River or take a short stroll and dip your feet in the cool mountain water. Whatever you are looking for you will find it here. From our heart to yours. My daughters and I brought my mom to celebrate her birthday. We truly enjoyed the beauty inside and outside of the cabin. We cant remember the last time we laughed so hard and its largly due to being wrapped in this amazingly cabin. Orions heart is what it advertised A slice of heaven. We will be back and highly recommend Orions Heart to future customers. This was a fabulous vacation. Staff was great....cabin was phenomenal! We will be back and you should do yourself a favor and stay there too! The team was very friendly and helpful. Orion's Heart was a beautiful cabin. Each floor has a balcony and your own space. It's in a private location and very cozy. We will rent this cabin every chance we get.